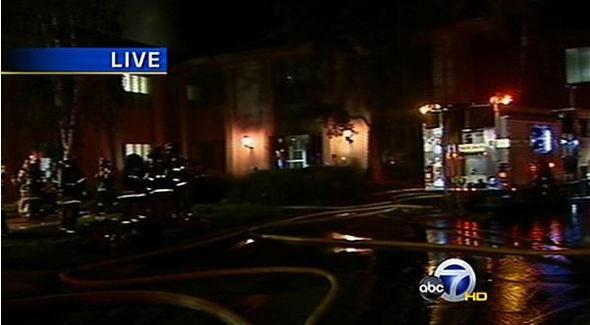 SAN FRANCISCO — Multiple Bay Area news outlets report that an Apple research and development facility located at 20605 Valley Green Drive in Cupertino was set ablaze late Tuesday night, with NBC affiliate KTVU blaming a malfunctioning air conditioning unit. Given that this was an Apple R&D facility, it’s naturally operated nearly 24 hours a day, and at least 100 Apple employees were forced to evacuate the building in the three-alarm fire. Also given that this is Apple we’re talking about, no one has any idea what these folks were working on. As of 12:30 a.m. Pacific Wednesday morning, Santa Clara County firefighters report that they expected another hour before they could put out the blaze completely. See the Jump for a map of the fire relative to Apple’s headquarters in Cupertino (basically, it was across the street). I heard that building has to do with IT newtworks, no RD work there!! Women reporter name is “Lisa”…!! Actually, all the articles keep referring to it as R&D or IT. Actually the building houses the management and creative offices for AppleCare. The fire took place above the management offices and the works who create and maintain the Support part of Apple’s website: http://www.apple.com/support. But since they use Akamai for redundancy, you won’t experience any in site access.